MYBC had an excellent opportunity to go birding for an extended period at the Sanford Lagoons on Saturday the 12th. 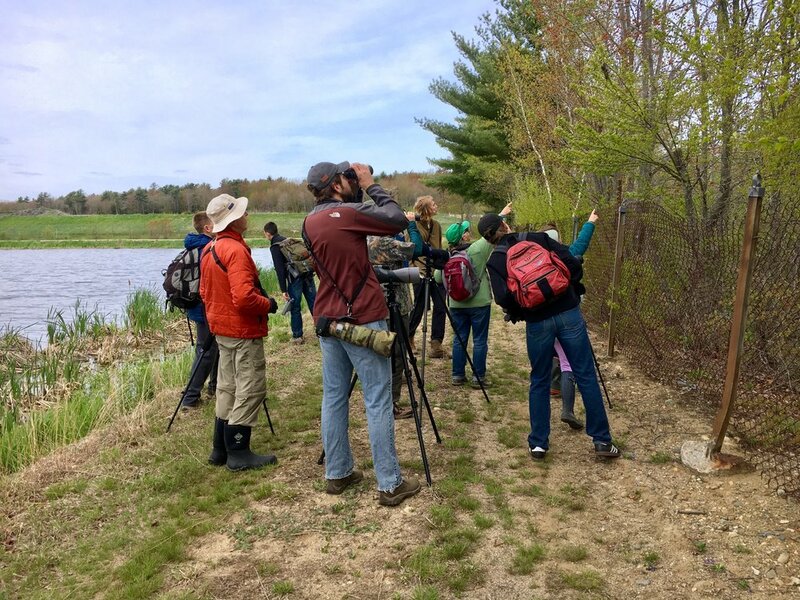 7 young birders and special guests David Doubleday, Sue Keefer, and Steve Norris had an awesome time exploring this amazing hotspot outside of Sanford during peak migration time. We wouldn't have had this opportunity if it weren't for the generosity of the management at Sanford Lagoons allowing us to spend additional time on the weekend. We would like to thank them along with Andy Aldrich for helping to coordinate this effort. The day started out strong with upwards of 20 species within the first 10-15 minutes, including several Bobolinks, Least and Spotted Sandpipers, and brief but solid view of Wilson's Snipe. The latter being a lifer for many! Our goal was to try and see the influx of wood warblers, but to do that we needed to make our way past the treatment ponds to the tree line. As one may guess, there were LOTS of birds along the way. As we made our way further down the path, we heard a very distinct "err-uh, err-uh" coming from the reeds. As we wanted to make this a learning experience Lena and Seth tried quizzing the young birders to figure out what family the bird that was making that call was from. After a short time, the young birders deduced that it was a rail, and specifically that bird was a Sora. We wanted to get a actual view of the bird if possible, but with rails it is difficult to catch a glimpse without using playback of some form. Another learning opportunity arose regarding the ethics of playback. Especially in the Spring, bird song playback is discouraged as it may unnecessarily disrupt normal bird activity and increase stress levels of territorial males etc. Using bird calls is far better than songs, but should be used sparingly. After some discussion, we concluded that this would be a reasonable use of playback so we tried it. The Sora began increasing it rate of calls, but alas, we never got a view of the bird. Moving forward, we spotted some small ducks in one of the ponds, and excitingly, one of them was a Ruddy Duck! That was on the "hope-to-see" list for several of the young birders. We finally made it to the tree line, and had a decision to make of going left or right. We may have made a poor decision in going left as the sun was backlighting the trees making it more difficult to see the warblers... Regardless, it started out slow with a lot of "heard-only" warblers, but things picked up as we got further down the line. Sue called out "Blackburnian!" which despite being high in the tree, many (unfortunately not all) were able to get a glimpse of this beautiful bird. At one point it became difficult to keep track as there were Ovenbirds, American Redstarts, Yellow-rumped Warblers singing and moving about in the trees. Lena then heard a very high pitched song that turned out to be a Blackpoll Warbler! Again many saw it, but the group was getting fragmented at this point making it more difficult to communicate. There were some other fun highlights. Garrett spotted a pair of Bald Eagles, one of which was attacking a female Mallard with ducklings looking for an easy meal. Ian noticed a beautiful male Chestnut-sided Warbler which alighted on a branch where we were walking. We also spent considerable time trying to deduce an unfamiliar bird call, which Lena concluded was a Wilson's Warbler in the distance. As we were concluding the trip, we noticed some very motionless Snapping Turtles in the ponds. Sadly they were no longer alive (we deduced this by the age-old trick of tossing pebbles near one of them), but it is a fairly common occurrence coming out of the cold winters. On another note, this was Lena Moser's final outing with MYBC as co-coordinator. Lena was one of the original co-founders of the club and MYBC would not be here today if it were not for her vision and passion for educating youth in the natural world. Though we are sad to see her go, we know she has a lot of fun and amazing adventures in her future, and we are forever thankful for her help and dedication to the Maine Young Birders Club.